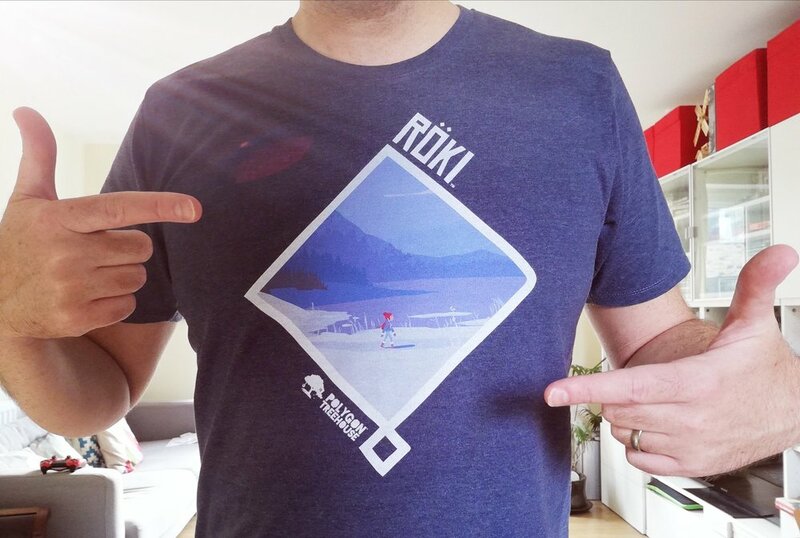 Hello everyone and welcome to this week’s Röki blog. 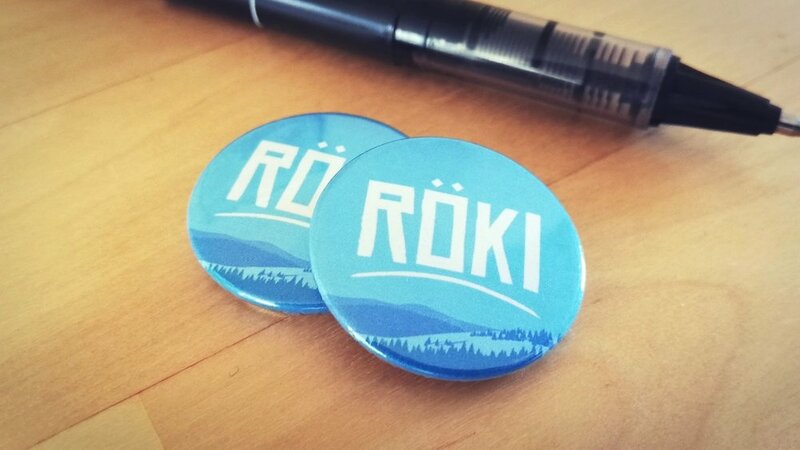 You may have seen some pictures of prototype Röki swag floating around on our social media accounts. When we say ‘swag‘ we are of course referring to promotional and merchandise items rather than illicit stolen goods! 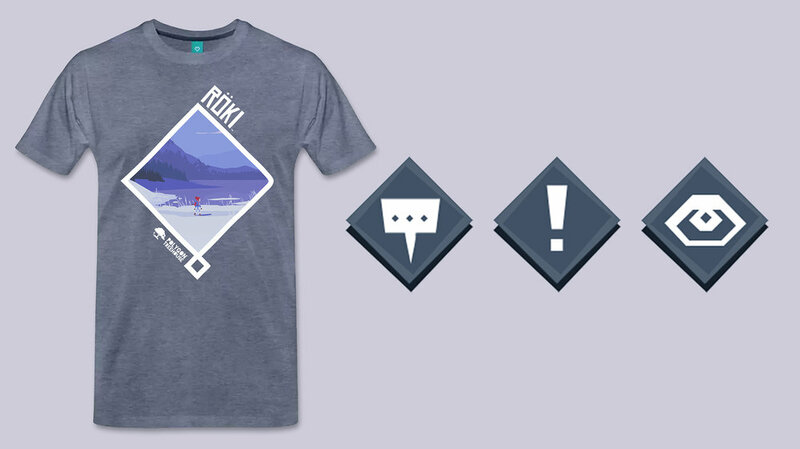 We’re talking about things likes badges, character art cards and t-shirts and so on. We’ve experimented with bits and pieces in the past that were pretty neat, but you might wonder why the sudden flurry of activity now (apart from the fact that Alex was bored one weekend). The short answer is AdventureX. We were thrilled to be one of only twenty or so titles accepted to showcase at the event so we thought we should go armed with goodies for people to take home to remember our game by. Beyond that it looks like we’ll be showcasing the game at events more next year so it’s good to be prepared in advance. There is so much to take in for people going to events that it’s good to give them something to jog their memory when they’re sifting through their swag pile the next day. It’s also a nice way of raising awareness of your game and also helping people easily discover your social media channels (if your Twitter handle is prominent) so they can keep up to date with the latest news and developments around your game. They’re fun items to giveaway outside of events too, in fact we’re having a competition to giveaway some sets of the above characters cards on Twitter. As part of this ‘Swag Pass‘ we wanted to take a second crack at designing t-shirts. We’d done some previously that had an all-over print. They were pretty cool and quite striking but the printing methods means that you got flaws at the seams down the sides and shoulders so in the end we decided against trying to perfect them. We still wanted striking shirts but wanted to make sure they had an excellent finish. We started thinking about how we could house artwork on the shirts and had a brainwave. We did some experiments using the diamond form the game’s interaction icons and extending it to create a ‘nordic knot‘. We thought this was pretty neat and created a great focus so we started tying out different art work using the same framing motif, it worked pretty well so we decided to run with it! At this point the t-shirts only existed in Photoshop so we thought we’d take the plunge and get a prototype printed up to see how they looked in the real world. It game us a change to test out a new t-shirt manufacturer, Spreadshirt. We were sold, they came out great and the design worked well, high fives all round, although we didn’t want to stop there. There was another reason for trialing Spreadshirt. They also offer a print-on-demand service and allow designers to set up stores within their site. Print-on-demand merchandise was something we’d been interested in for a while. It essentially means there is no overhead for you as a company, you don’t need to get loads of stock created in advance and you can offer a great deal more choice to people. So after exploring it we decided to try our hand and created…..
We’re not really sure what to expect from it but it was very quick and easy to set up once we had the designs we were happy with. We thought it was a nice way for people to show their support the game and help spread the word, if they so desired! Anyway, that’ll do for today. Hope you enjoyed talking about swag and if you do pick up a shirt please tell us what you think. What the Flip is Non-Linear Music?